Such a claim isn't always true, but it sometimes is. And you might argue that it applies particularly to the F1 circuit. It certainly applies to Suzuka, the welcome stop-off for this weekend's Japanese Grand Prix. Of course some of the sport's newer venues are better than others, but none have got even close to quickening the pulse among drivers and aficionados alike as happens when cars circulate this venue. In fairness, not that many of the older tracks have either. This is mainly because the Suzuka layout is dominated by challenging, snaking, undulating turns, the sort that separate the great from the good, the sort that would most likely be laughed out of court were they proposed from the ground up. Very much unlike the modern circuit too there aren't always vast car parks of run-off areas for drivers to use as a benign get-out if they get it wrong. That modern curse of policing 'track limits' scarcely gets mentioned here. It doesn't have to be. The circuit also is narrow with the ideal racing line like walking an ever-veering tightrope. 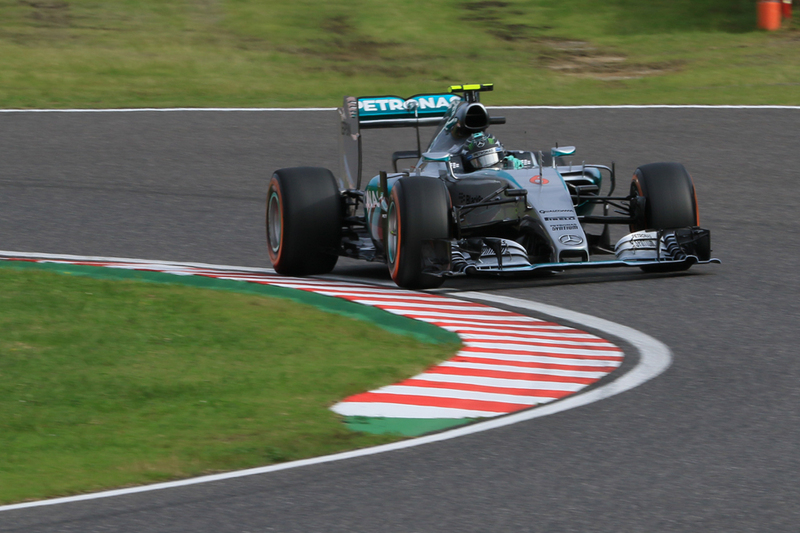 Precision at Suzuka therefore counts and even a slight error can end your chances definitively. Indeed such is Suzuka's classic nature it feels like Messrs Nuvolari, Fangio and Clark should have pounded around the track in their heydays; that F1's first visit was as late as 1987 strikes as wrong somehow. Especially as that the track opened a full quarter century earlier in 1962, the sport’s pinnacle for some reason being absurdly slow on the uptake as to this pinnacle venue. You can combine all this with the track's uncanny knack of being the stage of drama and acrimony. Add too that the Japanese crowd never fails to be numerous, nor defers to any other when it comes to passion. You have a near-perfect mix. 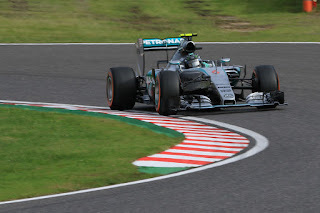 is Nico Rosberg better placed? There are at least a couple of reasons for Mercedes to be optimistic about an immediate bounce back in Japan after its stumble in Malaysia. This sort of track suits the Merc - fast, with long turns and harder compound tyres. We can think back to the similar challenges of Spain, Britain and Belgium earlier this year – and in Sepang just passed - and that in each Merc dominated on raw pace at least. Also here there aren't many big braking zones which means its efficient energy recovery comes to the fore. As for which Merc pilot may emerge on top, such have been the twists and turns (which rival even Suzuka's) in this tete-a-tete trying to pre-empt it is rather like nailing jelly to the wall. We've seen repeatedly that small matters - minute set-up tweaks discovered in practice and the like - can make the crucial difference. But this one has got critical. After Sepang's astonishing goings-on Lewis Hamilton you feel simply must get something back on his team mate Nico Rosberg this time. Encouragingly for him he has won in the last two Suzuka visits, but it may be nevertheless that Nico of the pair can consider this one his home patch. The German's bagged pole on both of those occasions and lost out peculiarly in either race - at the first turn last year while the year before it rained. 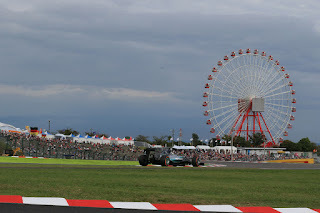 Lewis meanwhile has never qualified at the front at Suzuka plus has often, by his own admission, struggled to find an ideal set-up at this track. As for the rest, until relatively recently Suzuka meant Red Bull. Of course, the high downforce and aero efficiency requirements of this circuit is just the Milton Keynes thing; the RB12 is by consensus a better chassis even that the Merc's. But with Red Bull though at least something will depend on the extent that its Renault power unit can push its cars along. At Suzuka there are a couple of lengthy full throttle stretches as well as a few uphill acceleration zones, and all of this could be bad news for the Bulls. All in therefore, as in Malaysia they may require fortune to prevail. 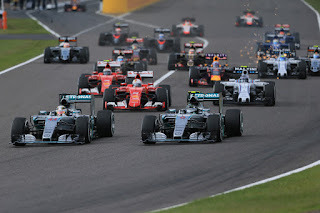 Ferrari likely will to an even greater extent, as matters remain iffy and recently got iffier. Even Sebastian Vettel's strong record at Suzuka with four wins from the last seven visits has been shop-soiled, as this time he'll carry a three-place grid penalty on a track that it's likely to hurt. Kimi Raikkonen might take an engine penalty, either here or in the following one in Austin. Reflecting what has been said, in previous years other Mercedes-powered cars have shown up well here, indeed in last year's finishing order after the Mercs and Ferraris the next four home had German power. Heck even the Lotus got a double helping of points. Valtteri Bottas in the so-powered Williams has qualified third here in each of the last two seasons and last year he finished fifth just three seconds behind Raikkonen's Ferrari. McLaren could be particularly intriguing. Honda for its home race will have an upgraded (or rather, lighter) power unit in the back of Fernando Alonso's machine, and Alonso has indeed identified Suzuka as one of the remaining rounds that McLaren will go well at. 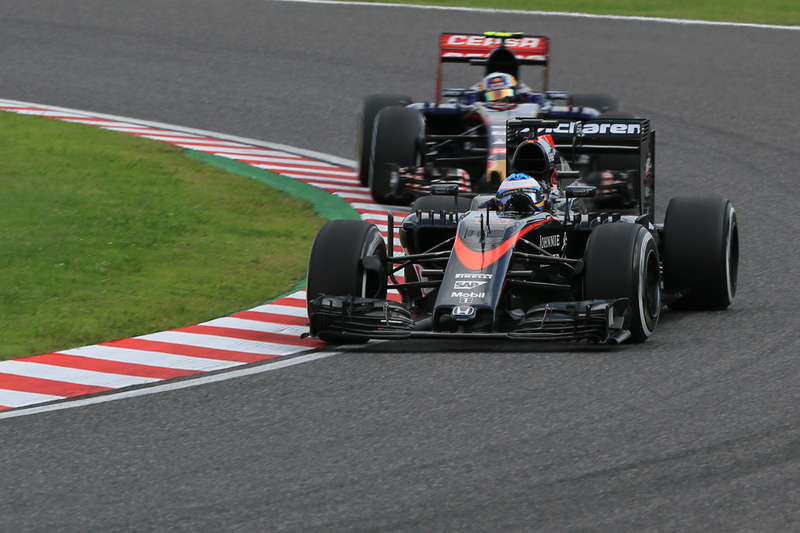 We've mentioned energy deployment, which Jenson Button said a few rounds ago Honda was outstripping all rivals in. What can McLaren Honda do at home? Suzuka also is a track that strains the cars and in particular the engines given the high average speeds and ever-varying gradients and loads. And a DNF could have rather a major impact on the championship fight, with for all that Lewis's engine failure in Sepang caused reverberations the same for Nico and Lewis winning out here will leave the Englishman top of the drivers' table. But on the flipside for Lewis another DNF does not bear thinking about... Suzuka also has an incredible knack of being the place where significant things happen, particularly in regard to the world championship destination. Grands Prix here often are a strategy battle. 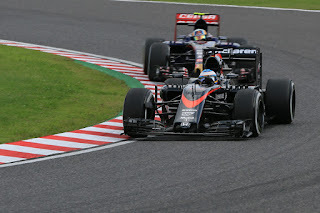 Overtaking isn't easy; qualifying will be of greater importance than usual, as will the start and first turn shakeout. And of course as we seem to say every time the Mercedes starts haven't always been brilliant this season. The bottle-neck first turn often is the scene of grief too. Furthermore the successive long corners and direction changes put a lot of loadings into the tyres, particularly the fronts leading possibly to dreaded thermal degradation, and the relatively abrasive surface strains the rubber too. Multi-stop races can be expected therefore, with two usually preferred to three. Just as in Malaysia we have the added complication that the extra compound brought this year is the soft, joining the usual medium and hard of before, though the evidence of last week in Sepang was that the soft holds on pretty well to allow two-stoppers at least. It'll be interesting to see if anyone starting outside the top 10 tries a one-stopper as Bottas and Jolyon Plamer did with success in Malaysia. 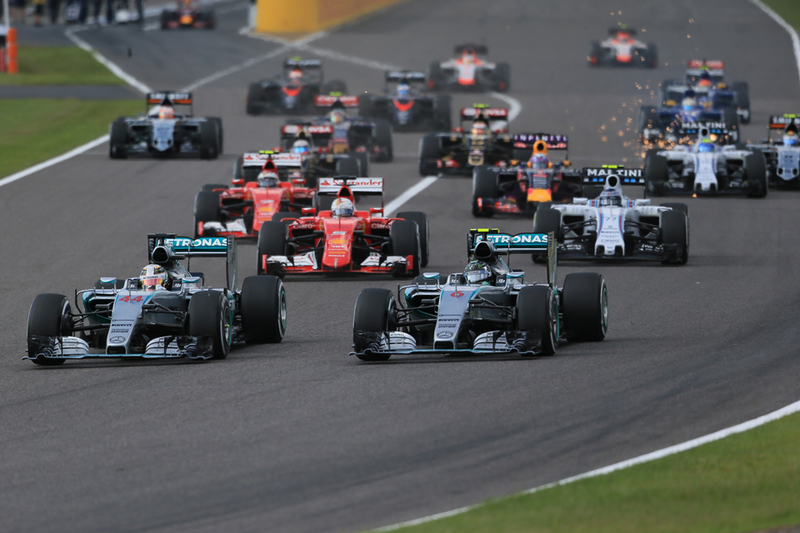 Being gentle with the rubber can be crucial in terms of your strategy options in a Suzuka race and the undercut is powerful particularly with the long lap – this got Rosberg ahead of Vettel in the final stops last year. Strategies may be hard to set in advance with much certainty, as approaches are likely to evolve during the race depending on the degradation experienced. We can add another variable too. Japan is synonymous with rain; sometimes vast quantities of it. 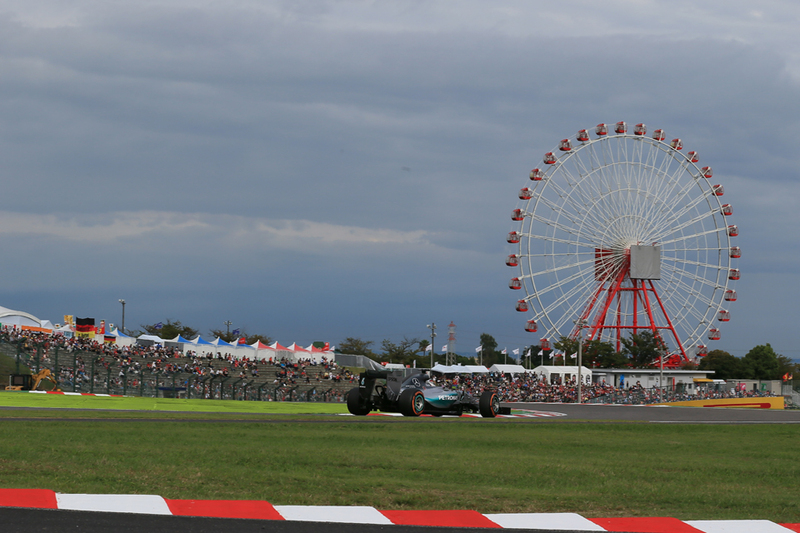 Suzuka particularly so, and indeed twice here qualifying has been held on Sunday morning due to Saturday's running falling victim to weather. Current forecasts suggest this weekend's weather will indeed be unsettled (though Typoon Chaba will have left the area). This at the very least could scupper set-up time as well as jumble the grid, at a place as mentioned where track position is more important than most. 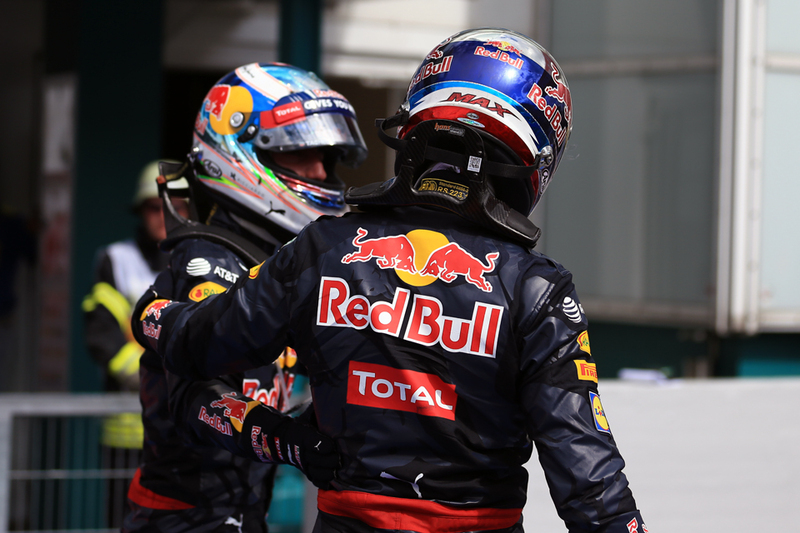 Ricciardo has said since Singapore that a wet race, perhaps here, will open up a conspicuous chance for Red Bull to win. So plenty to think about heading into our Suzuka weekend. Which is just the way it should be.